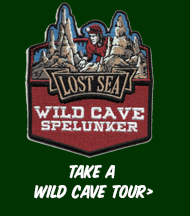 Experience the Wild Cave Tour! Cave clean up 7:00 to 8:00 a.m. Cost per person includes regular Lost Sea tour, boat Ride, spelunking tour and overnight stay. Prices are the same for all participants regardless of age. Size of Group & Deposit: This tour requires a minimum of (12) participants (if you wish to bring less than (12) participants you must pay for (12) participants.) Full payment must be made two weeks prior to the arrival date. Groups of 100 or more or groups scheduling in January or February are advised to make reservations at least one month in advance. A $100.00 deposit is due when you make your reservation and will be returned after your tour. What if my group number changes? The number you confirm with will be the number you will be charged for. If you add people to your group less than two weeks after your confirmation date a $5.00 charge per person in addition to their ticket price will be charged upon your arrival. Reservations and Confirmations must be made by telephone. Meals: A MINIMUM OF 20 PARTICIPANTS IS REQUIRED FOR WILD TOUR MEALS. Meals will be served in our restaurant, not in the cave. If your group is planning to eat meals, it is very important that you schedule at least 2 weeks before arrival.